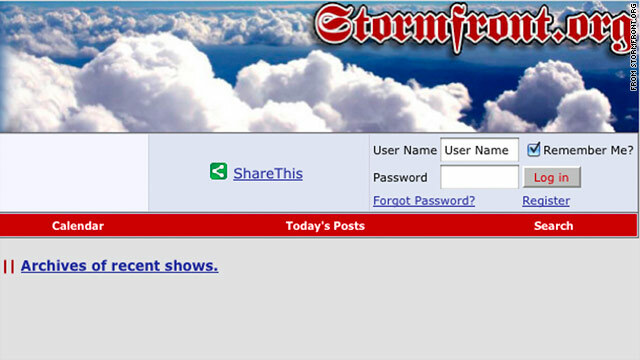 This a screen grab from the website stormfront.org, whose motto is "White Pride Worldwide." The far right in Europe has enjoyed a renaissance over the past 30 years, driven by resentment of the growing powers of the European Union and by rejection of the "multiculturalism" that has accompanied rapid immigration from the developing world. Political parties opposing immigration and integration have done well in elections in recent years - and beyond them, neo-fascist and "national socialist" groups have become well-established across the continent, including in Germany, Belgium, the Netherlands, Italy, Scandinavia, Hungary and the United Kingdom. Most of those belonging to such groups would not contemplate the sort of carnage that occurred in Norway on Friday, but they would probably sympathize with what appears to have been the manifesto of the alleged assailant, Anders Behring Breivik. Breivik claimed that "cultural Marxism" had morally degraded Europe, and purportedly wrote: "You cannot defeat Islamisation or halt/reverse the Islamic colonization of Western Europe without first removing the political doctrines manifested through multiculturalism/cultural Marxism." Elsewhere he said: "One of the most widespread manifestations of the craziness of our world is multiculturalism." There are plenty of white supremacists who subscribe to such views on websites like stormfront.org, whose motto is "White Pride Worldwide." On the site's discussion forums, one thread entitled "Scandinavia Struggles Against Multiculturalism" warns that "a united Europe could become a strong wall against Islamic 'cultural' invasion, but instead Europe has become a gateway for Islam." The thread, which has been active for several years, contains reports of alleged rapes by immigrants, warns about the low birth rate of native-born Scandinavians and links to videos of far-right protests. Another thread is titled: "Please Nordic people, keep white Scandinavia." And the day before Friday's attack, one forum participant wrote: "Norway must wake up and deport non-whites." In his own writings, the alleged Norwegian bomber appears to have complained about the "Muslim ghettofication process'" in Oslo - a term also used by the far right in Denmark. Without espousing such apocalyptic views, far-right political parties in Scandinavia have tapped into this anger - and reaped dividends at the ballot box. The far-right Danish People's Party (Dansk Folkerpartis) has 25 seats in parliament; the Sweden Democrats Party won 5.7% of the vote in the 2010 election. In Finland, the True Finns party made a dramatic breakthrough in April's elections, gaining more than 1 in 5 votes. Beyond Scandinavia, France's National Front won 15% of votes in the first round of regional elections in March 2010, even though it was not on the ballot in the entire country. President Nicolas Sarkozy's party only managed 2% better. In the Netherlands, Geert Wilders (a politician admired by Breivik in his writings) has successfully stirred up hatred against Islam and the establishment; his Party for Freedom has become the country's third largest, with 24 seats in the Dutch parliament. Wilders has compared the Quran to Hitler's Mein Kampf and has tried to have it banned in the Netherlands. It appears that right-wing fanaticism is no longer limited to the U.S. and the right-wing thugs in Washington. Are these new right-wingers really any worse that the current Eurpean leaders? Somehow I don't think so!!!! shocking! are you saying that it's all the right wingers fault? Wow, what a novel idea from an American voter : blaming the other side! That NEVER happens these days. When will you think outside of right and left? The day we finally get this country back...but for now, carry on blaming the other "team" for all your problems while both sides do the same thing. The right wing in Europe is more left than the left wing in the US. When will goverments learn that this is one possible outcome of drawing foreign people into their countries and demanding that they all get along. Different cultures are just that – different! I hate no one, but I keep to my own culture since I have NOTHING in common with others. Why don't people just stay where the hell they are and live their lives as they were raised? I enjoy the multculturalism in Europe. I have two European nationalities and speak three European languages! I read a lot about America, Russia and Asia and I am happy with what I know. @estelle: not sure where you are from, but the US wouldn't be here as we know it if people just stayed where they were and were raised where they were raised. Face it. You're part of the problem. I disagree with the tone set in this article concering Wilders. He did not stir up hate. There was resentment amongst the population which he is voicing. He has some serious points regarding the lack of integration amongst certain minorities, the abuse of our social security system and the way they are overrepresented amongst criminals. These problems have been neglected for decades by the establishment which allowed those problems to grow bigger over time. Now that the only way to solve it is harsh action it won't go down so easy, but that doesn't make Wilders a hatemongerer. Minorities who abide the rules and try to integrate (even if partially) in Dutch culture have nothing to fear whatsoever. It's the extremists, criminals and parasites that Wilders is aiming at. Their neonazis are no different than USA neonazis, who call themselves the "Tea Party." The only difference is the TP also scapegoats Mexicans, as well as Muslims and Liberals. We kill Muslims because Muslims kill us because we kill them because of who knows what. What a world. Fareed, you made the comment that the Muslim population in Europe is around 3% and will level off in the not too distant future. Well, there is a video circulating the net which says that societies need to have an average birthrate of 2.11%, to survive and that many, including N-America are well below that, and that the birth rate amongst Muslims is well above 2.11. THis means, if correct, that the Muslim population on many countries will outstrip that of the indigenous culture, and in a democracy this will mean they will have the power to vote in what they want, including Sharia Law!! So maybe our grandchildren should prepare themselves for a growth in civil wars, as the indigenous culture pushes back hopelessly! ?